Listen to the latest science news, brought to you by Benjamin Thompson and Noah Baker. A machine that not only learns, but also carries out chemical reactions. Research paper: Granda et al. Sequencing the genomes of microbes in permafrost could help scientists predict future greenhouse gas levels. Research paper: Woodcroft et al. Silica can be used to toughen up self-assembling DNA scaffolds. Research paper: Liu et al. Never miss an episode: Subscribe to the Nature Podcast on iTunes, Google Podcasts or your favourite podcast app. This is a transcript of the 19th July 2018 edition of the weekly Nature Podcast. Audio files for the current show and archive episodes can be accessed from the Nature Podcast index page (http://www.nature.com/nature/podcast), which also contains details on how to subscribe to the Nature Podcast for FREE, and has troubleshooting top-tips. Send us your feedback to podcast@nature.com. Welcome back to the Nature Podcast. This week we’ll be finding out how to toughen up DNA nanostructures with silica, and meeting a robot chemist. Plus, we’ll be hearing how the genomes of some very important microbes could help scientists predict global levels of greenhouse gases. I’m Noah Baker. First up this week, reporter Adam Levy has been talking to a chemist who’s been on the hunt for a high-tech lab assistant. For chemist Lee Cronin chemistry is all about discovery. And despite methods and techniques that have developed leaps and bounds over the centuries, for Lee the process of discovery is still all about the journey. It’s very difficult when you ask a chemist in the lab to go discover something. It’s a bit like asking someone to go in a boat now and find a new continent. Something invariably goes wrong and more interesting happens, and then we follow that up, and I think that is the point where conventionally a lot of discoveries are made today. But despite his love of the voyage, Lee thinks it’s time to change up the process. Not the aspect that relies on some magical combination of luck and intuition, but exactly how the search is carried out. Lee wants to automate the quest for new reactions. Machines already exist to automate certain tasks in chemistry, but they tend to follow specific programming and recipes rather than searching for new discoveries. There have also been attempts to aid discovery with machine learning, where a computer is trained with data and learns how reactions might operate. Lee wanted to make a machine that could learn and carry out tasks. I called him up to find out more. So, what we’ve tried to do is use machine learning to classify where the outcome of a reaction - that’s when you mix two chemicals together - whether something has happened or not, and then you can use that as a basis to then, you know, navigate round if you like your new chemical space or sail your yacht around your unknown islands and map them. And your machine isn’t just learning, it’s doing, it’s doing experiments. Yeah, we do three crucially important things. Number one, we start with an empty database, except just it knows the ingredients that we have at our disposal. Number two, it just randomly selects the ingredients, the chemicals to add together so it has no bias. And number three, it does this in real time so it actually decides what to do and then mixes the chemicals together and watches what happens. When we say ‘it’ in these sentences, we’re actually talking about a robot. Can you describe what this robot is, because it’s not like some kind of humanoid thing sitting at a chemistry lab table, right? No, but actually it does things very similar to what a humanoid would do or a human being would do at the chemistry lab table. A chemist would typically mix chemicals together in a round-bottom flask, put them on the stirrer and heat it up, and that is what this robot does. You plug the chemicals into the robot, and it moves those chemicals as liquids in a solvent to the reactor, and then the reaction happens and the robot automatically takes a sample and moves it to a detector. And it's basically like a human being using its eyes or your ears so it happens really quickly and seamlessly. So, is this really a closed system? Is this doing everything or is there still need for human input at some stage? Oh yeah, the human’s crucial. This is not about replacing a human. So, what this robot does, it’s just a labour-saving tool. The robot is only as good as the chemist that’s trained it. Well, the robot would do the experiment and the chemist would tell the robot whether the outcome of the experiment was reactive or unreactive, so whether something happened or not. And so, the robot will then start to guess after a while and then the human will go yeah, you’re right, you’re right. And then there gets to a crucial point where it has done about 10% of the possible combinations, it is able to predict what will happen next and it just speeds up our ability to discover new reactions and new molecules. Human time is limited and so one of the things that the robot can do is basically do reactions the human doesn’t have time to do and would normally discard. It can do about 36 reactions a day, and a chemist would only typically do maybe 3 or 4 such reactions a day. We’ve described how the process works, but have you actually managed to find anything novel with this robot? I’m pretty happy to say that I think I could convince maybe 9 out of 10 chemists that the robot had done some reactions where the outcome couldn’t be predicted beforehand, and that’s for me really exciting. Robots and automated machines are already used in chemistry, in industry. Just how different is the system that you’re using here from the kind of robots that might exist in other contexts in chemistry? What’s different about our system is its integration and the fact it searches for reactivity. What we’re doing is actually quite unusual in that it basically is able to search without any target in mind, and then what we needed to make sure we were doing, not just having new sensors and not having targets, but actually having machine learning to actually correctly search those reagent or ingredient combinations. What actual applications will these differences be useful for? Well, we’re really excited because we think in terms of discovery science, anything we need new molecules, so new drugs, new dyes, drug delivery systems, new materials. Now, there’s a problem when you’re discovering when you don’t know what you’re looking for. So, the next thing that we’re going to do is add another little sensor, but the sensor on to this will then have a desire and say right, we want to find, I don’t know, the bluest blue thing. So now, let’s not just look for new stuff but it has to be new and blue. And personally, what are you most excited about the opportunities that having this integrated robot system could open up? Well, I’m hoping that what it will do is tell us more about the laws of chemistry, and allow us to discover molecules that we just wouldn’t have access to using our existing knowledge. I kind of liken it a bit like to writing poetry. Shakespeare was really interesting in writing poetry and verse because he invented new words. What I’m interested in this robot seeing it do, is able to invent new reactions. Then those reactions can be translated back to the normal chemistry language, and then the chemist is able to use those new reactions to make new molecules. For me that’s super exciting. That was Lee Cronin from the University of Glasgow, speaking with Adam Levy. And if you want to see what Lee’s robot chemist looks like, have a look over on Twitter: @NaturePodcast. And - spoiler alert - it doesn’t really look like anything from The Terminator. The climate is warming as more and more greenhouse gases are released into the atmosphere, trapping radiation like an unwelcome anorak in midsummer. On the podcast, we spend quite a lot of time talking about the sources of those greenhouse gases - most often, the CO2 released from burning fossil fuels and methane from things like livestock and decomposing waste. But there’s one source we don’t discuss very much. This week in Nature, researchers have been using genomics to study the release of greenhouse gases from thawing permafrost. Now, that might seem like a particularly out-there bit of interdisciplinarity - genomics and atmospheric physics - but luckily, I had two researchers from the University of Queensland to explain. My name is Ben Woodcroft. And my name is Caitlin Singleton. Ben and Caitlin are studying the microbes within permafrost. I gave them a call to find out more, and Caitlin started by clarifying what permafrost even is. So, permafrost is soil that has been continuously frozen for at least two years. And that of course is made up of a mixture of minerals and also of organic compounds. Yeah, in many cases permafrost has actually been frozen for hundreds of years. People might have heard of melting permafrost being a source for carbon being released into the atmosphere. Tell me, how does that process work? The carbon is kind of locked away in the permafrost when it’s frozen. And so, when the permafrost thaws, suddenly this frozen food, effectively, it’s sort of like a freezer that goes off. Basically, it’s not the thawing process itself that produces the gas, but actually the metabolism of the things we’ve left inside the freezer that really drive the CO2 and methane generation at the side, and therefore climate change. So, you’ve got the microorganisms within the soil that start eating the newly-thawed permafrost. Where was the permafrost that you’ve been studying in this particular paper? So, we weren’t able to sample the permafrost in Australia because there’s no permafrost in Australia. Instead, we went to northern Sweden, to a place called Stordalen Mire. So, you wanted to look at the things, the bacteria, the microorganisms that are breaking down this permafrost and releasing this methane. To get an understanding of how that process worked, you tried to look at their genomes. But not just an individual genome, you wanted to get a sense of the genome of all of the bacteria and microorganisms in general that were involved in this process. Why do that? That’s a very good question. We have to do that because we can’t actually grow these organisms in the laboratory. So, in that case we have to use a technique called metagenomics to extract the total community DNA from the soil of all the microorganisms, and then we assemble all those sequences together into genomes. Using this we know who is there, and by looking at their genomes and looking at their genes we can figure out what they might be doing. But in the case of this paper too, we also used metatranscriptomes, so we look at the RNA and see which genes are actively being transcribed, and also which transcripts actually result in proteins being produced with the metaproteomes. Okay, so you’ve got all these data, you’ve got this understanding of sort of the population in general. Give me some sort of top-line numbers, how many organisms are involved in this, how many processes are there? Well, it’s very complex. We estimate that there’s at least 25,000 different microorganisms there. But of those we managed to recover the genomes for a little bit more than 1,500 microbial organisms. And are each of those working individually or do they work in networks, you know, are they each responsible for different parts of these biochemical processes? Definitely they are working together. You’ve got the organisms that start up the top and they start degrading the complex polysaccharide, such as cellulose and xylan. And then they pass on a lot of the by-products to different organisms down the trophic network, so you end up with fermenters, for example, taking in some of those more simple sugars and creating the products that the methanogens or methane producers can then use, and then those methanogens produce the methane. And then some organisms, they can actually use that methane as a carbon and energy source, and they release carbon dioxide. So, it’s quite a complicated network and there’s a lot of partnerships involved as well as competition. What does this provide us in terms of, you know, useful knowledge going forward to try to combat or at least better understand the way that the world is warming? Understanding the ways in which the microorganisms respond to permafrost thaw and climate change is a very large and overarching question. But the only way that we can make inroads into that question is to try to put these microorganisms into a framework that we can talk about them in. So, different microbial communities are going to react differently to different climate changes because there are going to be different chemicals present in the system. So, getting out the genomes of these microorganisms and learning about what they do gives us a sort of window into that system. And potentially, the long-term implication is that we can use this kind of information to better predict how earth systems are going to change in the coming years. And do you have a sense of the overall impact that could have, you know, how much carbon could be released from permafrost? Yeah, it’s predicted to make up to 174 petagrams of carbon available for microbial degradation and for potential release to the atmosphere. I think it’s on the same order of magnitude as the amount of carbon that’s currently in the atmosphere. That was Ben Woodcroft and Caitlin Singleton from the University of Queensland in Australia. You can read their paper over at nature.com/nature. Still to come in the News Chat, we’ll be hearing about a gene therapy to treat a deadly disease in mice - that’s at the end of the show. First though, Adam Levy is back with this week’s Research Highlights. Astronomers have peered at a black planet. A few years ago, NASA’s Kepler telescope spotted a distant star dimming about every two days. This regular flicker indicated a planet that was crossing in front. But now, on closer inspection, researchers have been unable to observe any starlight gleaming off the planet’s surface. This suggests the planet is more or less completely black. Observations like these could help astronomers test their theories of how reflective clouds form - or don’t - on these far away worlds. Shed some light on this story in The Astronomical Journal. Looking at the big picture of DNA from tumours could be crucial for unlocking their codes. The genomes of tumour cells often have some pretty big differences from healthy cells. Stretches of DNA can be duplicated or deleted. Researchers have used a recently developed technique to sequence long chunks of the genome of a well-studied breast cancer cell line. This technique uncovered regions where genes have been infused, as well as thousands of tweaks in the genome’s structure. Many of these have escaped methods that analyse shorter DNA fragments, suggesting these long reads could provide important information about how cancer genomes evolve. Give that a good, long read at Genome Research. 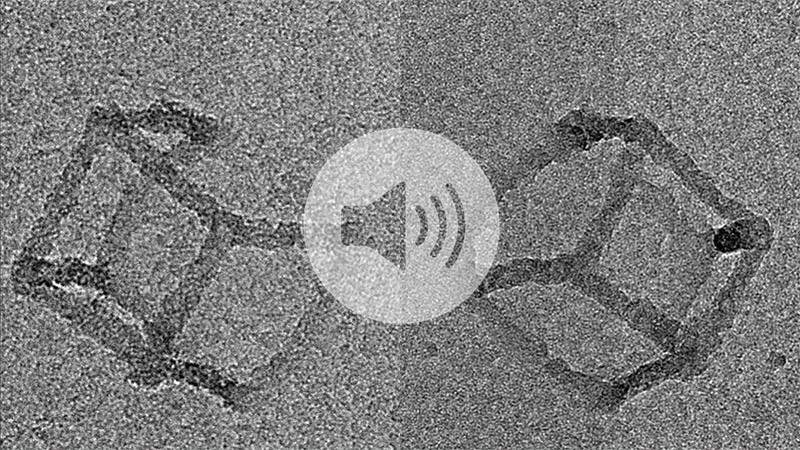 We had a story recently on the podcast about researchers who’d created self-assembling silica cages, just 12 nanometres across. There’s even a video about it on our YouTube channel. Well, we’ve got some more tiny structures on this week’s show, also involving silica, but made with a totally different kind of nanotechnology. Here’s Shamini Bundell to tell us more. Using DNA to code for proteins is the basis of building an organism. But living creatures aren’t the only things that DNA can build. Over the last 12 years, scientists around the world have been creating extremely small shapes and structures using a technique called ‘DNA origami’. We are now not treat DNA as genetic information carrier, but treat them as normal materials to create DNA nanostructures. This is Xiaoguo Liu of the Shanghai Institute of Applied Physics. Now, DNA itself isn’t the strongest or most stable building material, so in a paper in this week’s Nature, Xiaoguo and his colleagues report on a method for toughening up DNA nanostructures by coating them in silica. I gave Xiaoguo a call and started by asking him about the limitations in the current methods for making DNA nanostructures. One major obstacle is that to keep the structural integrity of DNA nanostructures, we need to use high concentration of cations such as magnesium. But if the DNA nanostructure is dried, it will suffer from distortion and deformation. So, that’s a limitation of DNA origami, that you either keep it in a cation solution with a high concentration of positive ions, or if you dry it out it might get distorted. And so, that’s why you wanted to improve the mechanical properties of these tiny shapes. We are trying to copy the structural information of DNA into inorganic materials. In our paper, we choose silica as an example. Initially we want to enhance the mechanic properties of DNA nanostructures because since some DNA nanostructure is rigid, but not rigid enough, they always distorted in solution. And so, we want to give it a tough shell to protect it and maintain the initial structural design. So, if you make a small DNA nanostructure, it’s quite delicate and will only survive in certain conditions, so silica would be a much more useful material to use. Yes, I think so. In fact, this is inspired by biomineralisation in nature. You know, many insects have exoskeletons that protect their gentle body, right. So, we use silica shell to protect the gentle DNA in our core and also maintain the structural information. And what can these small structures be used for? For example, it could act like circuit board. We can hybridise conductive nanowires and these DNA silica structures to realise nanoscale circuit. And the fact that you can make such tiny structures is obviously very helpful, but it’s not just the size or the structure - it’s also the composition. It has a flexible DNA core and a hard silica shell, so the total structure is both rigid and flexible. And in the paper, you mention using different thicknesses of silica so you can vary that level of rigidity. And the kind of structures that you can create seem very varied. In the paper there’s microscope images of tiny doughnuts and cubes and pyramids, but at the moment it’s still limited to just using silica as that extra material on top of the DNA, is that right? Yes. Currently we can only work on silica, and that is not enough. I think we just shed light on using DNA nanostructures as user-defined template for create inorganic materials. In fact, we are trying to use other inorganic materials like metal oxide because we prove the possibility of using DNA nanostructures as template. That was Xiaoguo Liu from the Shanghai Institute of Applied Physics in China, talking to Shamini Bundell. You can read the paper over at nature.com/nature. And to find out more about how DNA origami works, check out our stop-motion video on youtube.com/NatureVideoChannel, where you can also find the recent film on silica nanocages. Finally this week, it’s the News Chat and Senior Reporter Heidi Ledford joins us in the studio. Hi Heidi. Thanks for joining us. Right, for our first story today then, well it’s something you’ve written about actually. It’s a gene therapy in mice. So, what’s going on? Well this was a really interesting story. So, it was pegged to a paper that came out in Nature Medicine, and it describes gene therapy done in mice, as you said, but in fetal mice, so they were still in the womb when they were treated. And what is this therapy designed to treat? It’s designed to treat a particularly severe form of Gaucher’s disease, which is caused by a mutation that interrupts the breakdown of a particular lipid. So, this particular form of the disease is very severe - it often kills children before they’re two years old. And this isn’t something then I guess you can treat in a child, so they’re looking sort of pre-birth then? Yeah, it’s a tricky one because it affects the brain so much, and there’s an enzyme therapy that you can give to basically replace the enzyme that’s disabled in these children, but unfortunately it doesn’t cross from the blood into the brain so it’s not very helpful for this particular form of the disease. And in this study the group used a virus that was able to cross the blood-brain barrier to deliver the gene to the brains of these mice fetuses. Yeah, that’s right. And that’s something that is often a bit easier to do in a fetus rather than even a newborn baby because the blood-brain barrier is more permeable in a fetus than it is in a baby. I mean, so far so good then. But what are some of the hurdles that need to be overcome for this to be used outside of just mice and potentially in humans in the future? So, for this particular one they would have to test it more extensively in non-human primates and then there would be all sorts of testing before they could move it into the clinic. But sort of broadly speaking, I think one of the challenges for treating fetuses as opposed to babies is that you have to be really sure, I mean you always have to be really sure of the diagnosis of the disease, but that can be trickier when you’re dealing with the fetus, and you know you don’t have as many sort of measurements that you can take. So just because a baby has a particular mutation or a fetus has a particular mutation, in some cases it may not necessarily manifest the disease. There may be other mutations that compensate, there may be other, you know, factors involved. So, they need to really be sure before they you know start treating a fetus, that that fetus is going to be sick. And this work was published this week in Nature Medicine. What are some of the scientists behind it saying? I spoke to Simon Waddington at University College London who was one of the lead authors on the study. And this idea of fetal gene therapy is something that he’s been interested in for quite some time. But he said for a long time, people would just look at him like he was crazy whenever he brought it up. But in the past few years, there’s been so much success and so much sort of momentum behind gene therapy administered to children and adults, that people are starting to think oh, well wouldn’t it be great if we could treat some of these diseases even earlier, before they’ve done, you know, too much irreversible damage. Well, really, I mean I guess we’ve heard the phrase sort of gene therapy for a long time now, right? I mean how close are we then to something actually being available to the general public, do you think? For fetal gene therapy, I think they’ve got quite a bit more work to do. But you know, other gene therapies are coming along. The FDA has approved its first one last year, and there’s a lot of interest in pharma right now to develop them. Okay then Heidi, well that’s certainly a story to keep our eye on. Well for our next story then, let’s cover something very, very different. Now we’re going to cover a telescope with an awesome name that has just had its official opening. Can you tell us about that one? Yeah, the name I think is my favourite part. It’s called the MeerKAT radio telescope. It’s just been launched in South Africa. It is enormous - it consists of 64 dishes, each one of them is 13.5 metres in diameter. I mean, my goodness, that’s a lot then. And to call it just a telescope then is kind of a misnomer, it’s maybe more than the sum of its parts. Yeah, so MeerKAT uses a technique called interferometry which links many different dishes and antennas together so that they can act as a single telescope. Each dish collects a relatively weak radio signal from space and then these are all combined and filtered and turned into data that astronomers can use. So MeerKAT in particular is eventually going to be part of the Square Kilometre Array, which is this massive intercontinental facility that when it’s complete will be the world’s largest radio telescope. I mean that I know, say last week was the opening, but actually this telescope has been doing things since I think 2016, right? I mean, what has it accomplished so far and what are people hoping it accomplishes in the future? So far, they’ve put together the most detailed radio image yet of the centre of the Milky Way, which has this supermassive black hole. Now in the near future it’s got two more projects in line. One of them is to look at these fleeting astronomical events called transients, which include fast radio bursts. These are considered to be among the most perplexing phenomenon in astronomy. And another project will look at the formation of stars. Well yeah, nothing important right? Oh yeah, absolutely fine. Well what about the facility itself then Heidi, where is it based? It’s in a sparsely populated area in the Northern Cape of South Africa. There’s a lot of excitement actually I think within South Africa to have this gigantic telescope there. They’re saying, you know, that they hope it will raise the profile of South African science. I mean I think it’s already sort of dramatically increased the number of astronomers who are working in South Africa. Excellent news. Well Heidi, thanks for joining us, and listeners for the latest science news don’t forget to head over to nature.com/news. That’s all we have time for this week, but before we go we always love to hear what you think of the show, so hit us up on Twitter @NaturePodcast or email us: podcast@nature.com. Until next time, I’m Noah Baker. And I’m Benjamin Thompson. Thanks for listening.